Last time I talked about our dated and grimy entryway I added some much needed color which gave the room a more modern look all while bring in some excitingly bright colors. It was totally the motivation we needed to get this area completed. Naturally, the next step was get rid of the dingy worn out carpet and install new flooring. Don’t mind the door, there’s only one coat of primer on it. Click here to see what the entryway looked like in the VERY beginning! 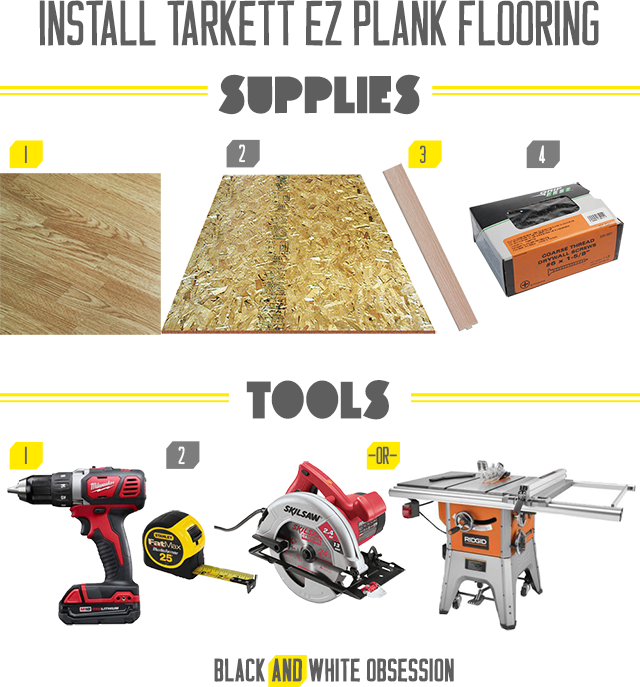 We chose to install inexpensive laminate flooring. We briefly considered painting our OSB (a plywood-like material) but with the cost of paint and the fact that the subtle texture would show through AND probably collect dirt like no other- we decided the extra $10 was totally worth the hassle. Remember we aren’t going for longevity in this area since it will eventually become an extension of our kitchen. On the other hand, we still needed the product to be Wisconsin weather approved- rain, sleet, snow, salt, sand, dirt, leaves, etc. Ok the photo is a bit more dramatic/dirtier than normal as it was the last day we’d see that carpet so we didn’t bother to vacuum up our remodel dust + mess. 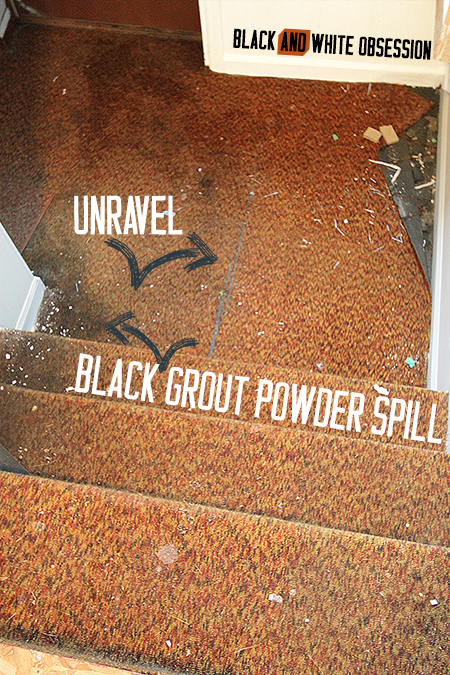 Once we tore up the old carpet we found this dark carpet pad layer that was completely stuck to the floor. Some of it came off easily (as in crumbled like ashes), while other sections required a bit more wrestling. Those somewhat stubborn areas required scraping using a drywall knife (it's what we had on hand), and gloves- since I’m a bit of a germaphobe. Measure and cut the OSB by taking measurements on both the upper and lower areas. Fasten the OSB to the floor using 1 5/8 in drywall screws with a drill. Test fit a few pieces of the laminate flooring (to see which direction you prefer and approximately where you need to make your cuts). Begin installing the flooring by starting in your preferred corner and snap them together, making sure to stagger the seams. When you’ve reached a corner/edge take your measurements in at least three different areas (in case your walls are like ours and aren’t perfectly straight) then run the piece through the table saw or circular saw and snap into place. We decided to also cover the riser part of the step which was pressure fitted into place. You could also try this super helpful video from Tarkett Official. Here’s where I hang my head in shame. 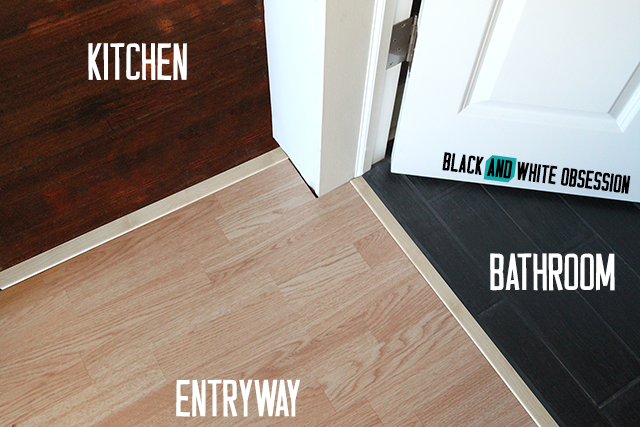 The most awkward area was where three drastically different flooring styles came together. 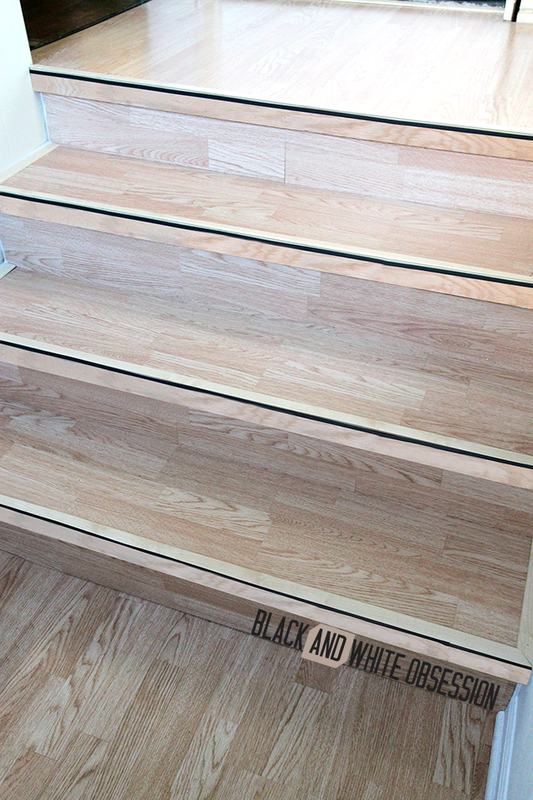 The kitchen hardwood, the entryway laminate, and the bathroom tile (sneak peek!). Don’t mind the missing shoe molding. I sense a new trend starting... #keepingitreal Again, thankfully we didn’t spend a ton of money to update the entryway area thus far, especially since we’re not looking for longevity. Either way, I’d say the light colored flooring is 1,000 times better than the original dingy orange carpet, no? We have a few more pieces to check off the list in the entryway, I hope you’re ready! Don’t you just love projects that start making the room look more complete? P.S. We were not paid or perked from any of these vendors; we just happily picked up the supplies necessary for the job. Want to follow along with the Entryway progression? 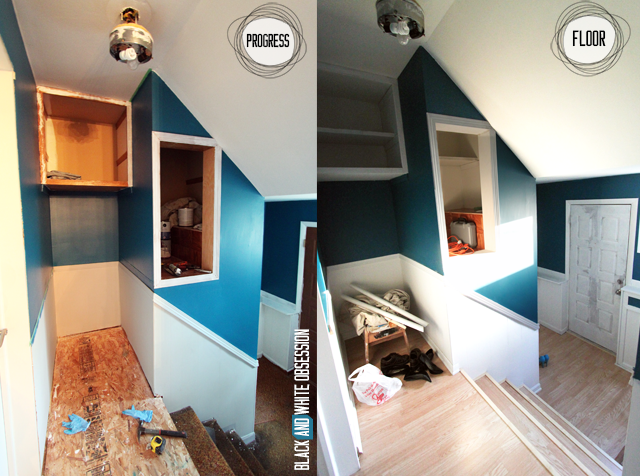 Here’s the $5 Drum Shade, Intro/Plan, Doorway Removal, adding storage using creative materials, and the magic of paint. That carpet pad was totally disgusting (as with a lot of things from this house when we first moved in ha!). The entryway definitely puts a smile on my face when I enter the house, so that's all that matters right?! Thanks so much for stopping by Angela!! It was a huge sigh of relief when we hauled away the dingy carpet! Thanks so much Zakkiya!! We're totally smitten with the colors as well! Beautifully done. I appreciate the inspiration so much. I've been thinking of doing this for awhile now. Just need to take the plunge!! Awe thanks Michelle, surprisingly it was fun (besides the carpet), and WELL worth it!! I'd love to see what you do with your space! WHOA! What a great difference you made without breaking the bank. The floor looks great with the paint the color too! Awe thanks Melissa! We still haven't hit the 'big reveal' yet but for an in expensive update during phase 1 we couldn't be happier!! We love that it's the time to 'test' out paint colors, textures, and styles before making things more permanent. Love the wood flooring Trisha! Your entryways is coming along fantastically! I can't wait to see the bathroom after that sneak peek! The bathroom is totally my favorite room in the house. I CANNOT wait for the day to put that reveal up!! Came here from All Things Thrifty. Looks nice! Checking out the rest of your blog now. Welcome Mindy!! So glad you stopped on by! Grab a cup of coffee and enjoy!! FONTS FONTS FONTS: Go Bold or Go Home!